They say a picture is worth a thousand words. Well, here are probably more than a thousand pictures put together and flipping fast … known as a video. And they pretty much tell the story without saying much more. I will just say … IMPRESSIVE! And here is another video. I can not understand what is being said, but again the pictures tell the story. The one thing I have against most of these is the vulnerable rear derailleur and off road use. This last one has an internal hub so it would get my vote. Of course, any of these could be equipped with an internal hub. 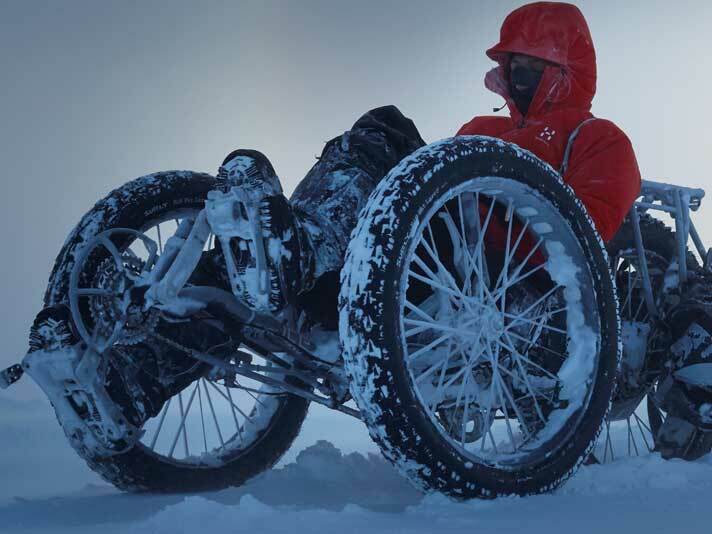 Anyway, if these trikes with the “fat tires” are capable of riding off road as these videos show than I am impressed. 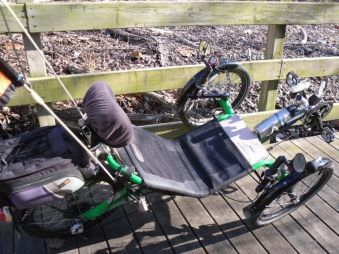 I have tried riding off road on my standard tadpole trike and when dealing with uneven ground it readily will tip over. That is not impressive. This looks like it would be fun to ride. 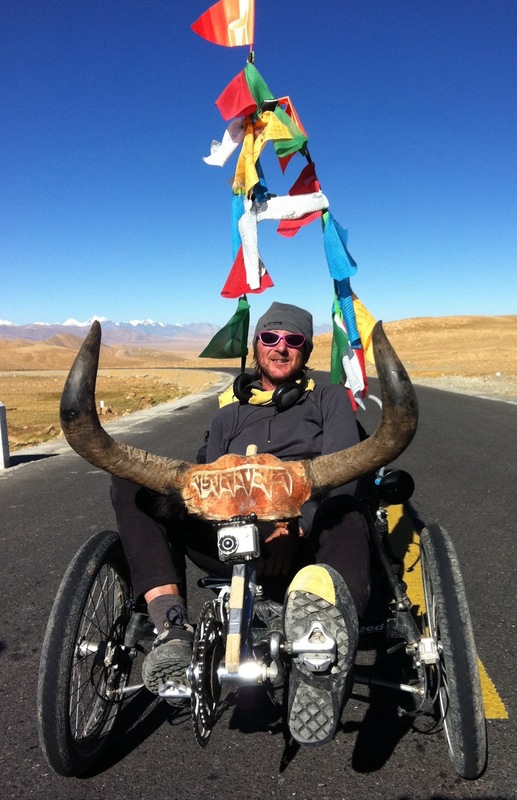 An Award winning film from Griffon Media about Paul Pritchard’s recumbent trike ‘pilgrimage’ to Mount Everest. Accompanied by Carol Hurst the ride took them on 1150km (714.5 miles) across the Himalaya from Lhasa to Kathmandu via Everest Base Camp. Considerably paralyzed on his right side he uses mostly his left side to function in life. That, of course, includes his tadpole trike riding. His is an interesting story and one which should both encourage and challenge the rest of us whether we do or don’t have physical problems to deal with. 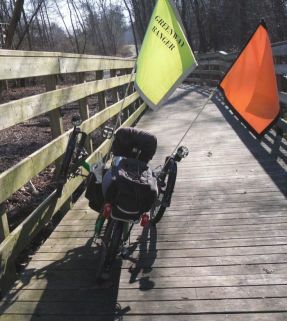 I have added another page on this blog with links to various websites pertaining to ORGANIZED BICYCLE RIDES, RECOMMENDED RIDES and ADVOCACY ORGANIZATIONS. You can always access it by clicking on the “INFO RESOURCES” tab. This is a Public Service Announcement … and I am asking … how bright are you and what is your aim? 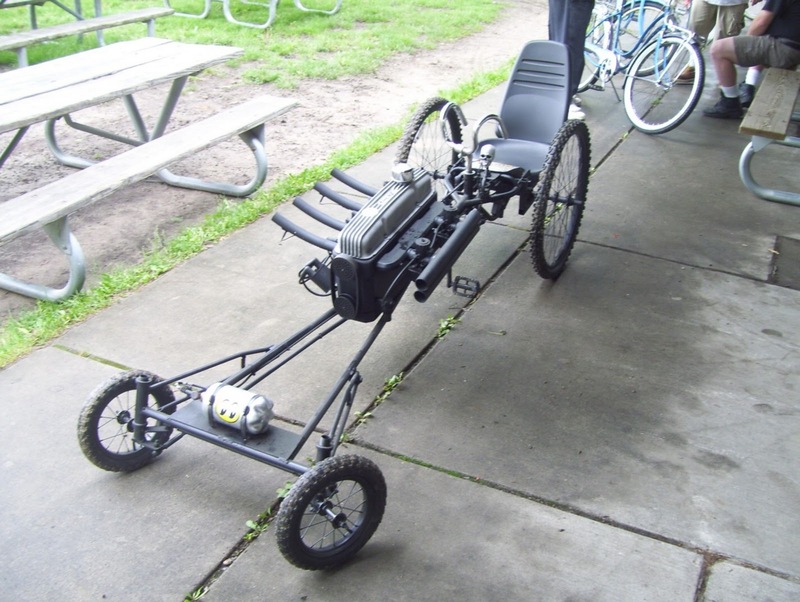 Recently on Steve Greene’s Trike Asylum blog Steve featured an instructional video about ICE trikes which ICE produced. 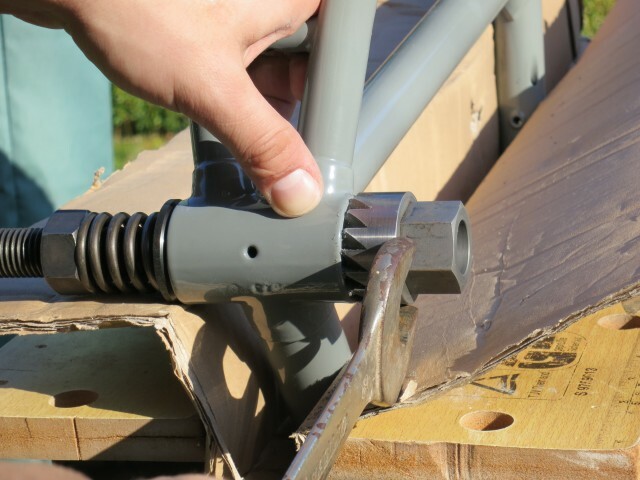 It demonstrates how to fit a chain on their Sprint and Adventure models. 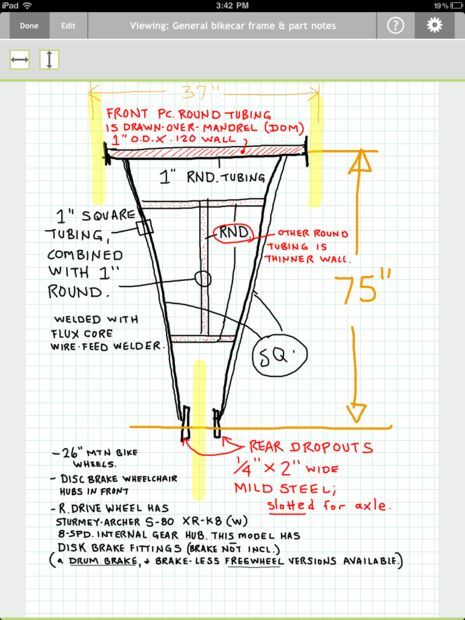 I thought I would share it here as it pretty much applies across the board to other brands of tadpole trikes as long as they have a derailleur system. Germany’s Steintrike has come out with a leaning trike (Wild Wave) which is full suspension. Although they are reported to offer it starting this past summer. I have noticed that there doesn’t seem to be much available about it and the one and only YouTube video of it is listed as private so it isn’t available for viewing. 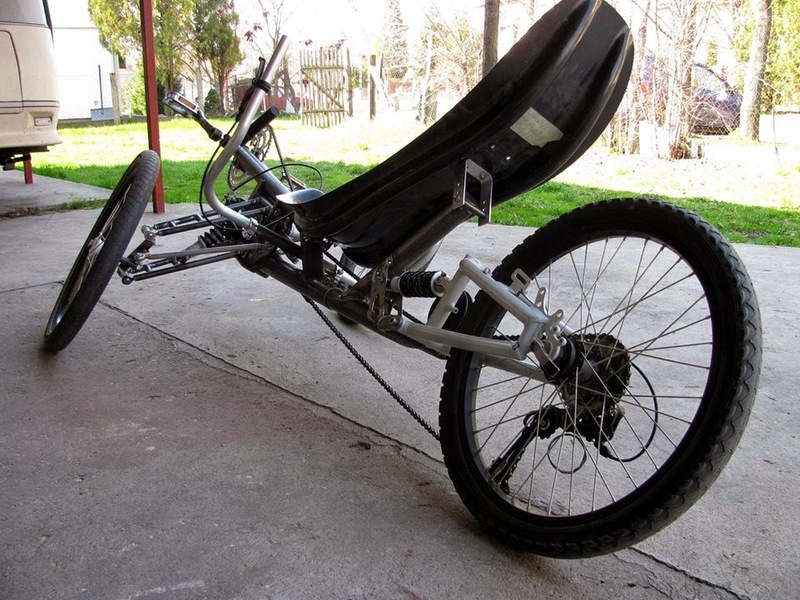 Steintrike has a WEBPAGE which mentions the trike but, again, the trike doesn’t seem to be available at this time even though they show it available June 2014. 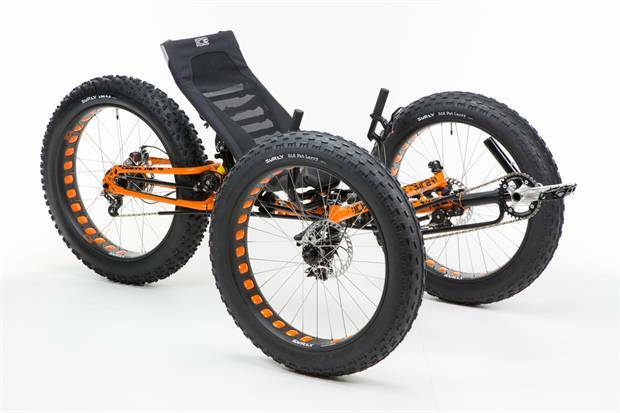 The webpage is confusing as they show clearly “Wild Wave”, but the pictures they have posted are all of the Wild One model which is full suspension, but doesn’t lean. This picture above is the only one of this model I have been able to find online. “The Steintrikes Wild Wave (WW) fully suspended leaning tadpole trike is now available for $4695 and orders are being taken (with late Summer delivery expected). Pending final verification, the mesh seat as well as the FRP ($150 upgrade including seat pad) seat works on the Wild Wave. The WW is also able to be set up with either 18″ (355mm) or 16″ (349 mm) wheel fronts and either 20″ or 26″ rear. In other news, Streintrikes now also offers carbon fiber seats – upgrading from the base model mesh seat is $595 ($790 with seat pad). I think they had a few problems in either translation or their use of English, but hopefully you can get the gist of it. Tadpole trikes are not made for climbing walls. A friend of mine found out the hard way. I don’t have any pictures of his accident as he was by himself at the time. Since I wasn’t there I didn’t see it happen, but I would guess that it was either a matter of going too fast or not paying enough attention. Either way the result was the same. He was turning a sharp 90 degree corner in this boardwalk (illustrated by yellow arrow in the second picture below). The first picture shows the trail as it goes along and to this boardwalk. 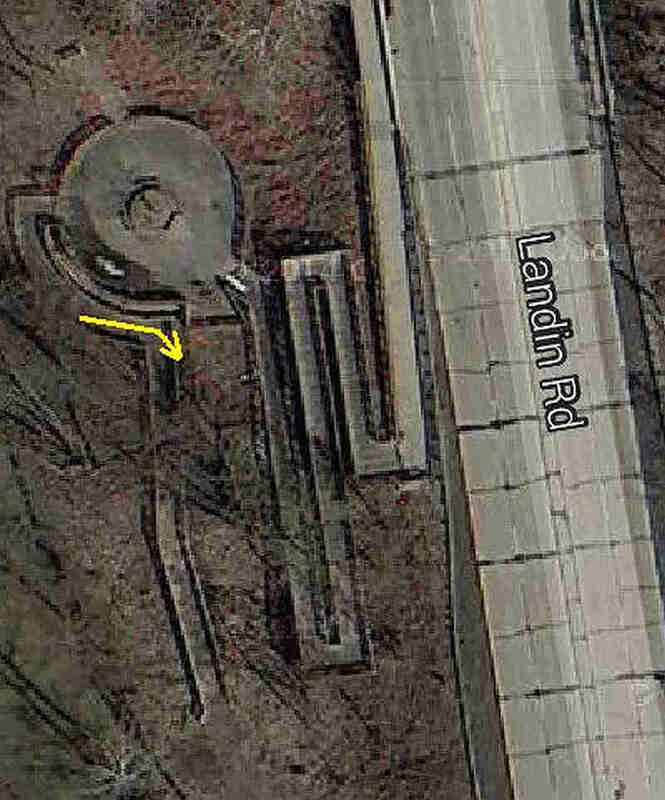 The yellow X shows where the accident happened. This section of the trail incorporates a zigzag boardwalk which connects the trail at street level to the trail down below … a matter of about 30 feet or more in height difference. You can see this in the video below. 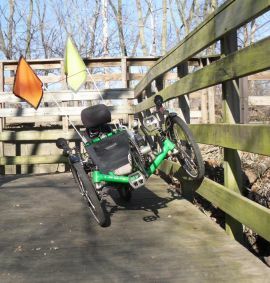 Here is a video I made several years ago showing the view of this area as I ride down this boardwalk ramp. 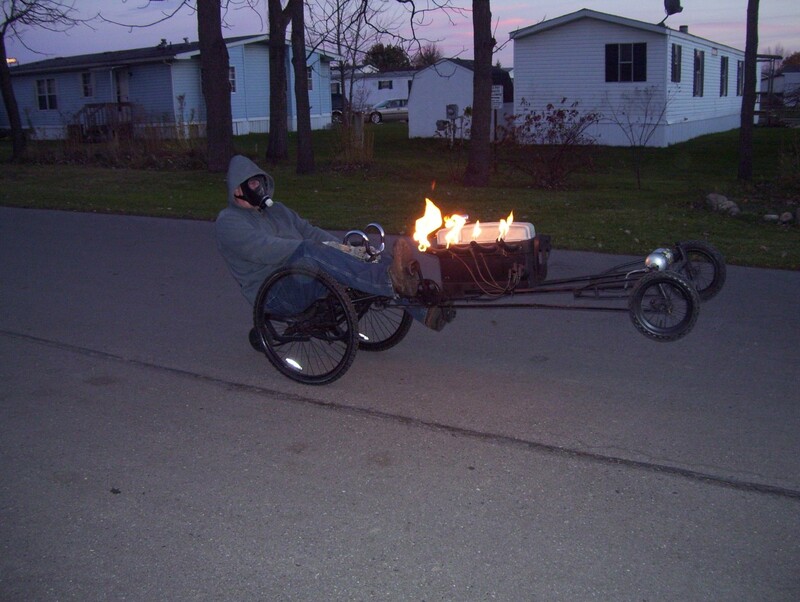 I was riding my homemade tadpole trike I had at that time. I apologize for the rather poor quality of the video. It has been cloned a couple of times at least and lost some quality with each copy (much like what happened in the movie, Mulitiplicity. Also I made the mistake of allowing YouTube to “stabilize” it which only made it worse. This boardwalk starts at about the 2:35 minute mark and the wreck occurred at about the 3:48 mark. By the way, this same friend had another wreck when he ran into the sides of another boardwalk which is also shown in the video at about the 6:38 mark. He was coming the opposite direction I am going in the video and was “hot dogging”. He broke his ankle in that accident. That was within a couple of weeks or so of buying his first tadpole trike. As my friend made the turn his left front tire got into the wooden fence and climbed up the “wall” until he tipped over. It flipped him over hard and fast and he landed on his shoulder and back and got injured somewhat. It was sore for quite awhile. Anybody who has followed my writings knows that I have said more than once that a trike is a blast to ride and relatively safe and stable. However, they will tip over and it doesn’t take much to get into trouble quickly. Once a trike starts going over it is difficult to recover from it. I took my trike to the place where it happened and positioned it so it looked like it was climbing the fence … in an attempt to sort of illustrate what happened. I could not duplicate it since I was by myself and had nobody to help either hold the trike in position or take the pictures for me. Here are some of the pictures I took. 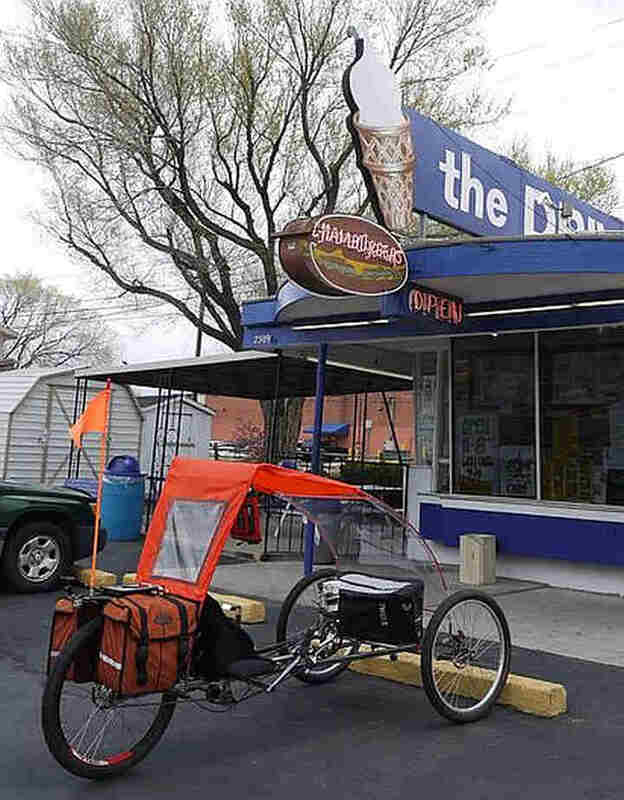 I think you can see that it would not take much for the trike to tip over, especially when the rider’s weight is suddenly shifted to the right as the trike gets into the wall and starts tipping. By the way, if you have not yet discovered it these wooden boardwalks can be extremely slippery when wet and very dangerous. I am almost 68 years old as I compose this article. I started riding bicycles when I was about 5 or 6 years old. To the best of my knowledge bicycle helmets didn’t exist anytime during my childhood including my teen years. At least I never heard of them. The year 1970 seems to appear when trying to do a quick research concerning bicycle helmets. I was 23 years old then. Anyway, like most people my age, I didn’t wear a helmet while bicycling as they just weren’t around then. Over the last many years I believe strongly in wearing them on a bicycle and I do if and when I ride a bike (which is rare nowadays). I stumbled upon this YouTube video about how these helmets are made and found it interesting. So I thought I would share it here. Do you see the bicycle helmet in the picture above? Of course not! It is invisible! That’s right. I am talking about an invisible bicycle helmet. 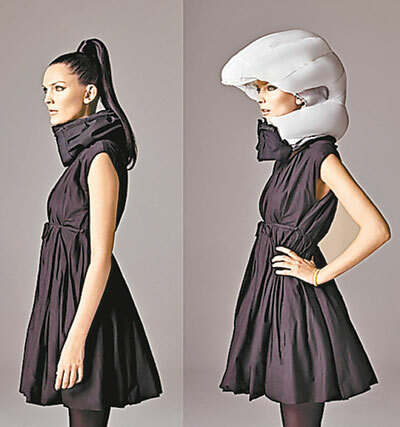 Seriously, there really is a product known as an invisible bicycle helmet. It works much like an automotive air bag. 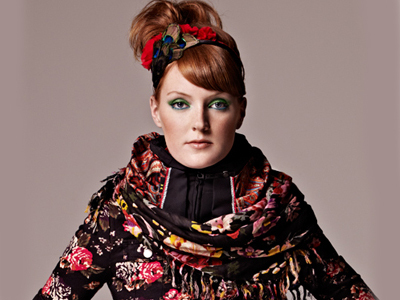 It consists of a collar of sorts worn around the neck on top of the shoulders. It weighs about one pound. On board electronics and sensors activate the gas filled “air bag” within 1/10th of a second upon triggering. There is even an on board “black box” which records useful information during the accident. 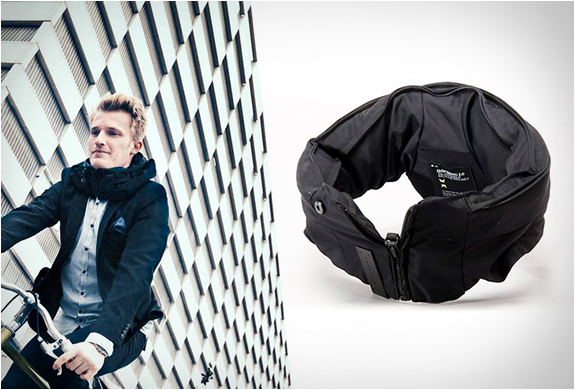 Like an automotive air bag it is a one time use matter so it isn’t a cheap way to go. It is an interesting concept however. The cost is approximately $600. (In the last video below it mentions a price of $450, but it is my understanding that the current price is about $600). At this time it is only available for purchase in Europe. 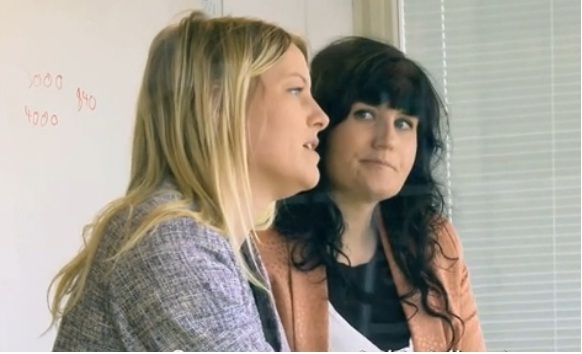 It is the invention of two young Swedish women. About 7 years of time and $10 million have gone into the development as well as a lot of testing. I don’t know if it could be used on a tadpole trike however. I think it would depend upon whether or not the trike rider has open space up around their shoulders, neck and head like a bicyclist does. That all depends upon the individual outfitting I guess. Some seat backs are higher than others and come up behind the rider’s head. Some use/have head/neck rests which would definitely pose a problem. Some have other items right up behind their heads which would be a problem. 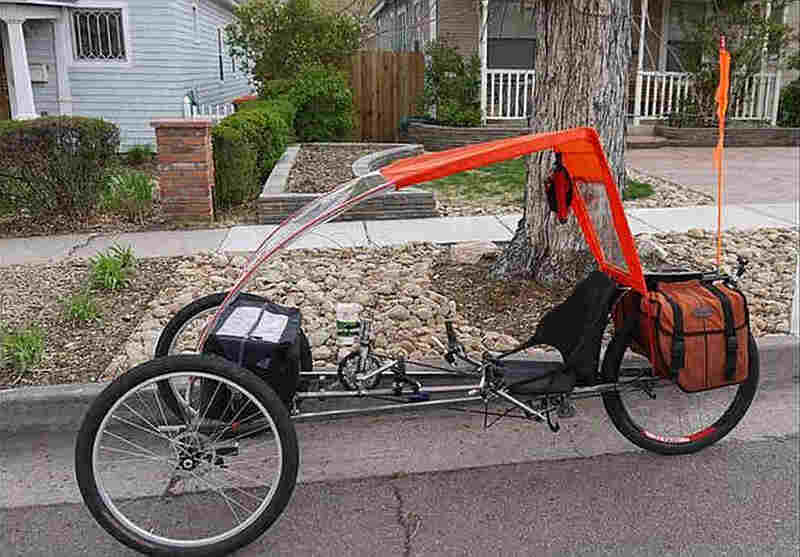 And if you happen to have a canopy over your trike that would probably be a problem as well unless there is plenty of clearance above and behind the rider’s head. Personally I would think that wear a pound of material up around your neck and shoulders could be a bit uncomfortable and get quite warm in summer weather. What do you think? Have they really got something practical here or is this simply vanity? One thing about it … the invisible helmet appears as though it would offer a whole lot more protection than a traditional bike helmet. It’s not a pretty sight, is it? I know. I had it happen to a winter knobby tire a couple of years ago. I knowingly over-inflated it by about 10 psi and while out riding the tire opened up a whole lot … the cords quite literally separated. I wish I would have taken a picture of the tire as it would have made a very good illustration as to why you should not over-inflate a tire. I have not been able to find any pictures online that look anything at all like the tire that I had which failed. I am sure that just how much concern there should be and resulting damage that could happen is dependent upon the brand of tire. What I am saying is that there is a difference in the quality of tires in their construction. The tire I over-inflated and suffered extreme damage was an off brand Chinese made tire. The regular tires I run, Schwalbe Marathon Plus, I am pretty sure I could over-inflate by more than 10 psi and nothing would happen to them. They are very well made and could take it I think. Speaking of Schwalbe tires HERE is their webpage about tire wear and premature failure. Anyway, it makes no sense to pay out good money for tires and then destroy them by not following the manufacturer’s instructions on tire inflation. The tire I destroyed was still like new as far as tread wear. I learned my lesson. I don’t care to lose any other tires before their time. Even if you don’t experience the tire self destructing, over-inflating a tire makes it more prone to being damaged by running over objects such as stones, holes in the pavement … most anything which produces sudden shock to the tire. Over-inflation will also likely effect tire wear. Usually the wear will be uneven. Inflating a bicycle tire with a hand pump the air goes in slowly. Inflating it with an air compressor is another story. 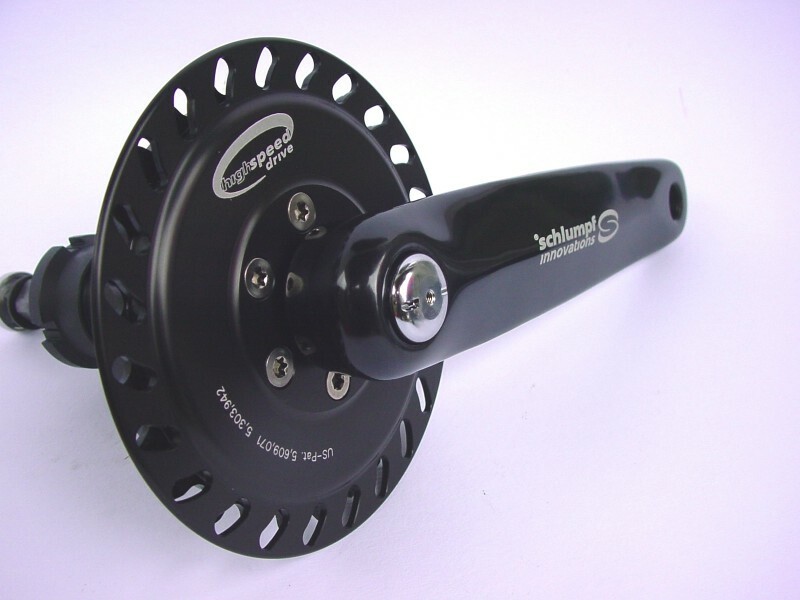 Since a bicycle tire is a relatively small area it will pump up fast with an air compressor and can easily be over-inflated quickly if attention is not paid during the process. Over-inflating a tire can also result in the tire coming off of the rim. 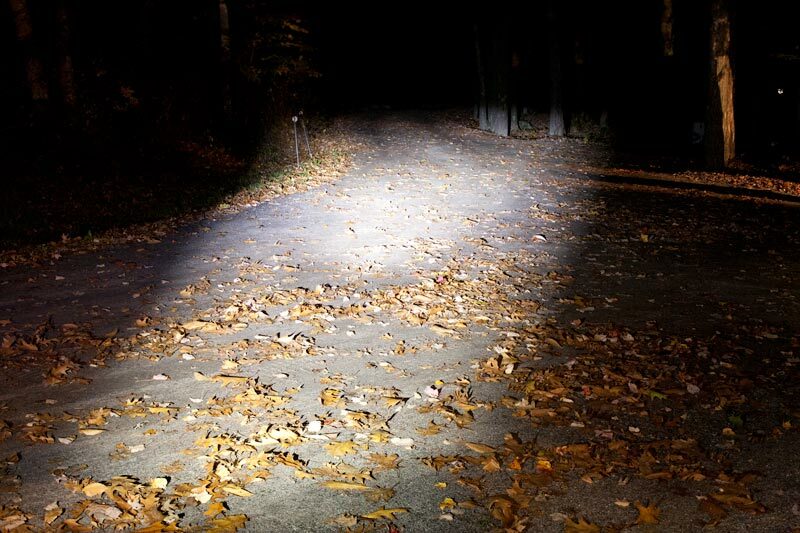 It may not happen immediately but rather it is most likely to happen while you are out riding. This, of course, means that you will have a pretty serious mechanical breakdown that you may not be able to handle unless you are mechanically inclined, knowledgeable and equipped to deal with it. Over-inflating a tire will result in a harsher ride … something most of us would prefer to avoid. Some people run their tires low on pressure so that they will have a softer ride. Under-inflation is not good for a tire either. Tires should be inflated somewhere within the range shown on the sidewall of the tire. Over-inflation will decrease rolling resistance while under-inflation will result in higher rolling resistance. Even inflating the tire anywhere within the proper range will have this same result. A tire which has a range of 70 to 100 psi will have less rolling resistance at 100 and more rolling resistance at 70. 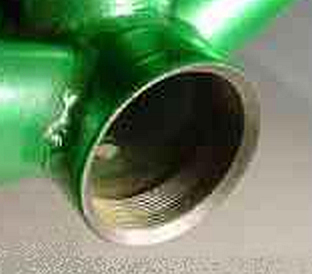 Under-inflation can also result in more flat tires and damage to the wheel. Over-inflation can also lead to wheel damage. Both over-inflation and under-inflation can adversely effect handling. BTW … UNDER INFLATION can also damage a tire and cause premature failure and need of replacement. Here is a picture of a tire with fatigue cracks from under inflation. 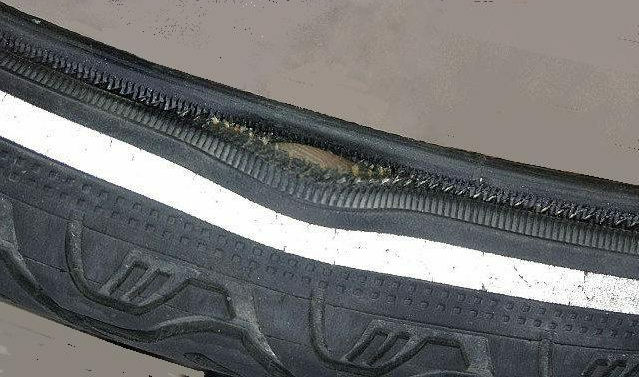 Such cracks weaken the sidewall and allow the internal pressure from the inner tube to “work” on it until they open up further and totally fail. You might hear an explosion when that happens.